The Rural Planners (Bryce Sharpe and Nick Fegan) reached the finish line in Huntsville at 4:33am. 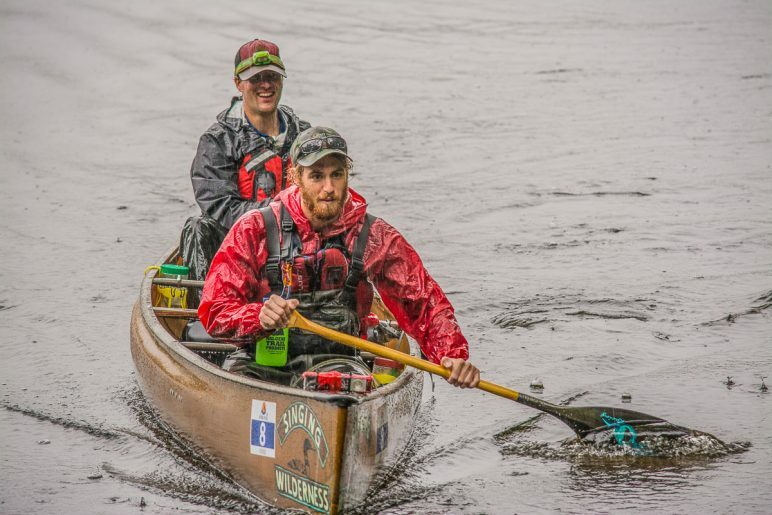 They had paddled for 34 hours and 51 minutes. Only 3 hours earlier, they had almost given up at the final checkpoint in Port Sydney. Their energy and spirits were low. 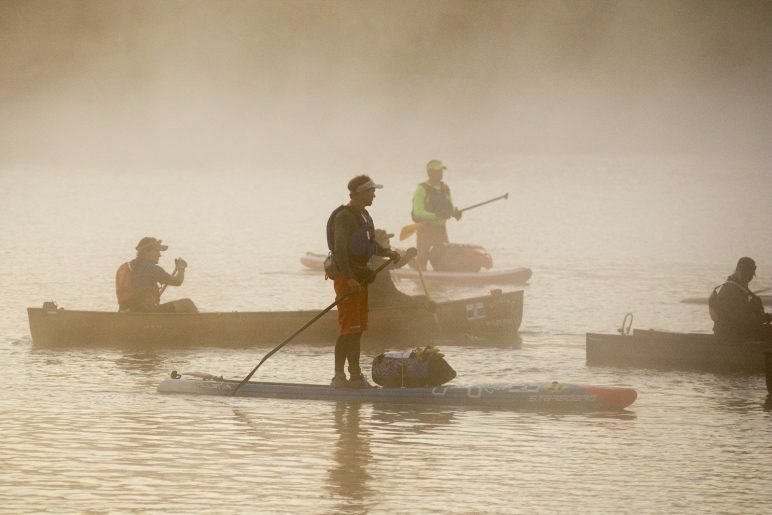 Even though both paddlers were experiencing nausea, they forced themselves to eat. They were wet, tired and exhausted. They had to keep going. With a quick change out of wet clothes into dry, a drink of electrolytes, and both forcing a Cliff Bar down, they set off to finish what they started. 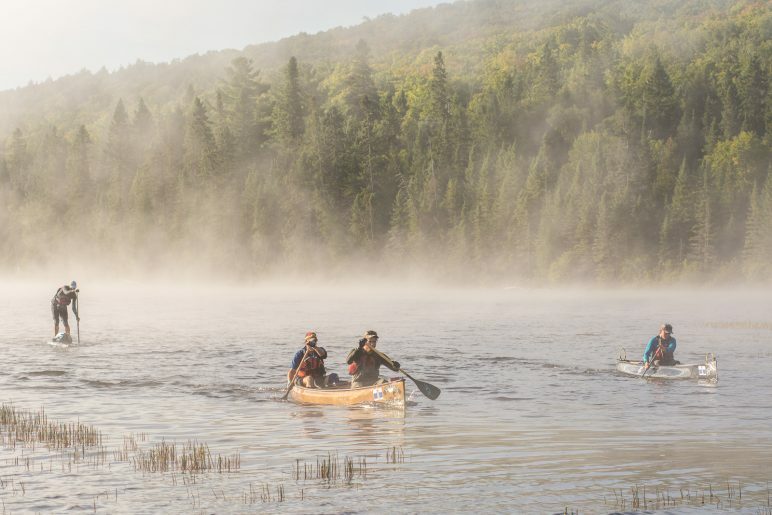 As a spectator and volunteer of the Algonquin Outfitters Muskoka River X, I followed The Rural Planners across Algonquin Park and through Muskoka trying to boost spirits at every possible encounter at bridges, checkpoints and portages. Family and friends formed a race crew and urged them on. 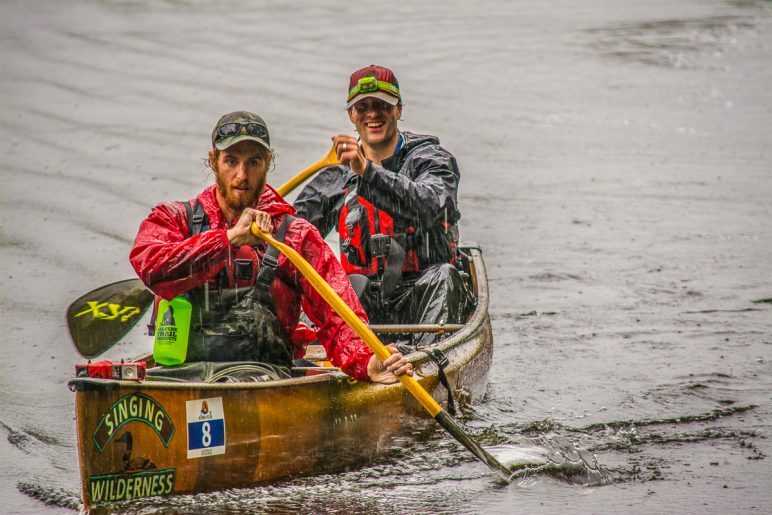 The Rural Planners had never competed in a canoe race before. 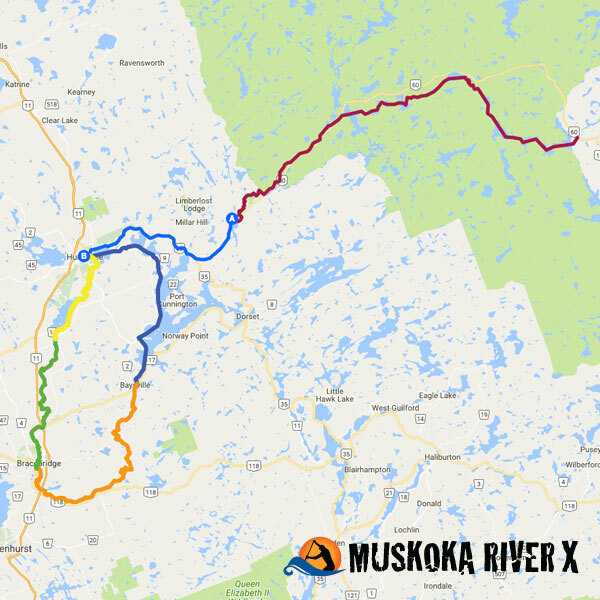 I’m not sure why they opted for the longest, most difficult route of the Muskoka River X. But they did, and they did very well at it. 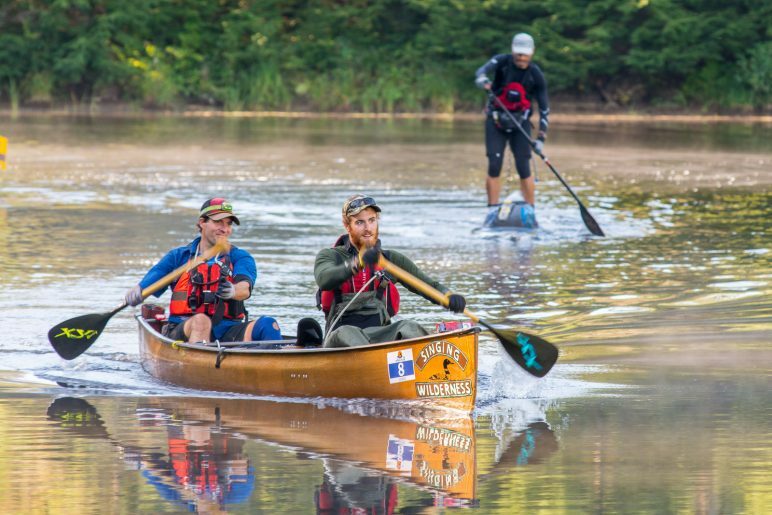 The Coureur Des Bois is a 48-hour route spanning 220kms from Whitney to Huntsville. 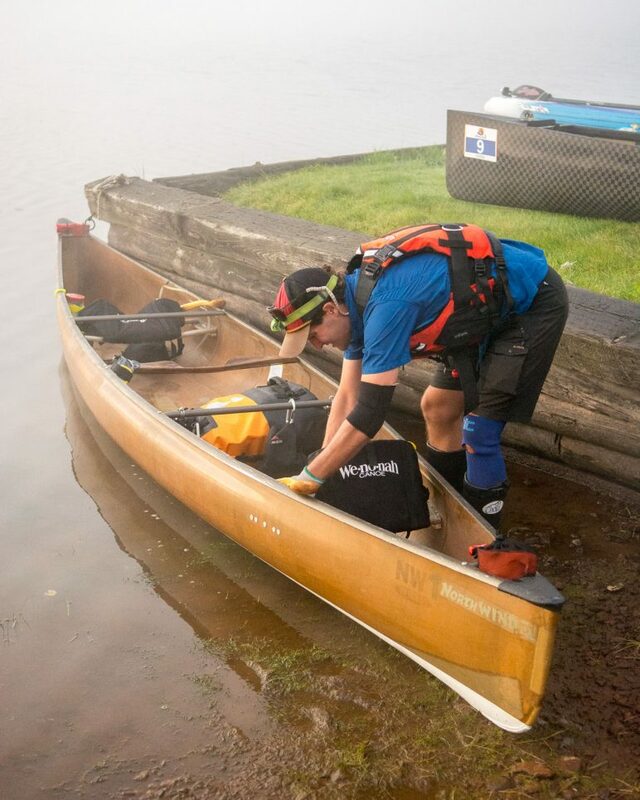 The Rural Planners started Friday morning at Galeairy Lake, and paddled 90kms through Algonquin Park to Oxtongue Lake where they spent the night at Algonquin Outfitters. 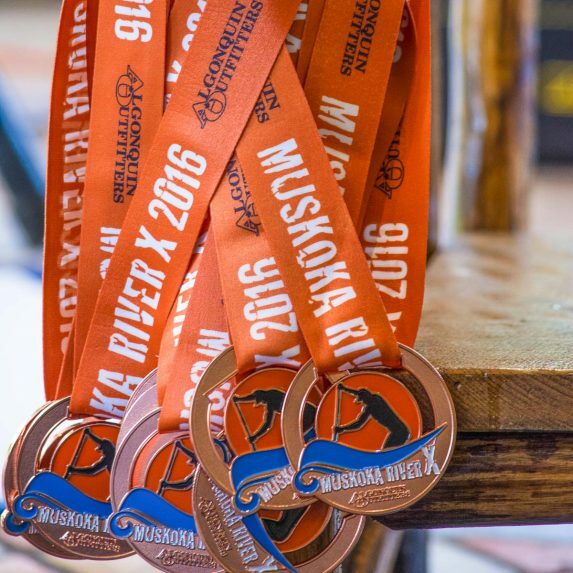 The next morning they were shuttled to Huntsville to race with the other teams competing for the 80km Sprint and the 130km Muskoka River X Classic. 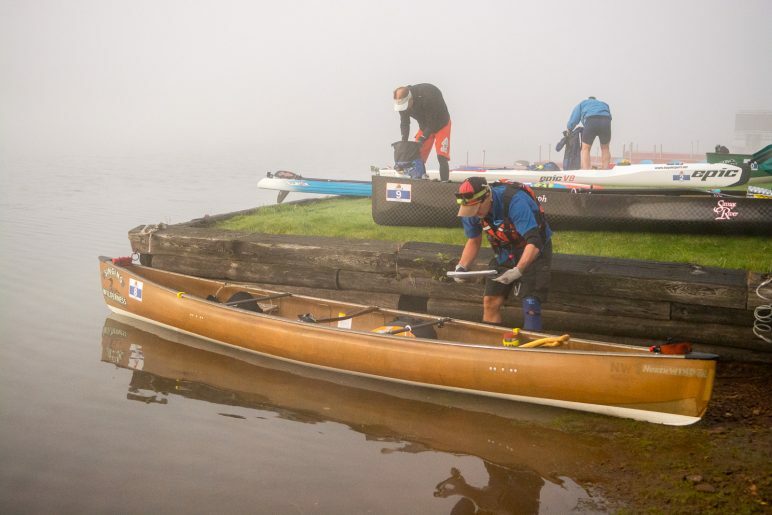 During the race they faced a number of challenges including dense fog, countless beaver dams, difficult portages around rapids and falls, shallow-water swifts, brutal headwinds and rollers on Lake of Bays, strong currents, and darkness. Their hands were blistered from paddling all day in the rain, and a raw sore had developed from a canoe seat. Why would someone want to put him or herself through such physical and mental pain? 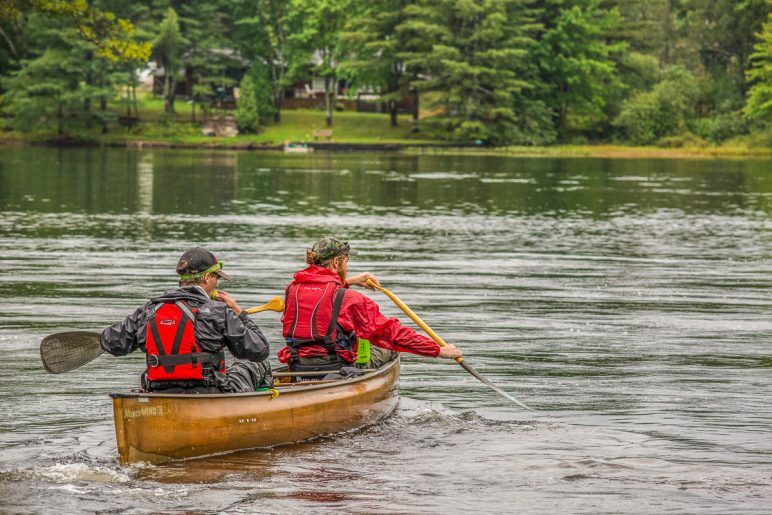 The Rural Planners had so much learning and preparation to do to compete in the Algonquin Outfitters Muskoka River X paddling race. They thought about how to mentally prepare themselves for the race and how not to think too far in advance. 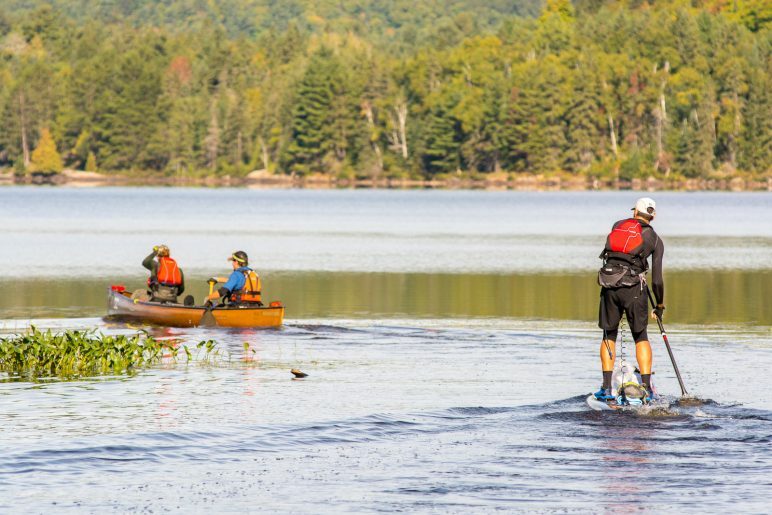 The goal was always to get to the next portage. And, they talked a lot about a pain cave. As a volunteer, I can’t say how amazing it was to be a part of such an awesome event. It was incredibly well organized and to help people achieve mental and physical greatness was just amazing! 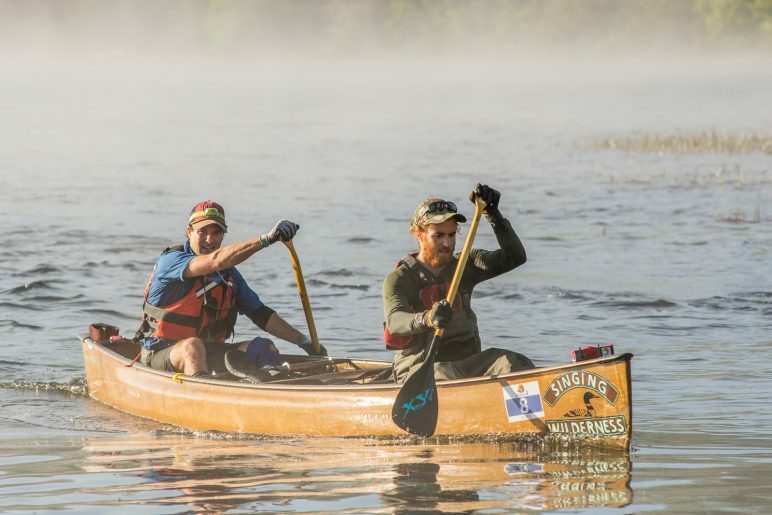 The 130km Muskoka River X Classic route is the longest single day expedition paddling race in the world. If you would like to be a part of this event, you might consider being a spectator to help cheer on the teams. This year, a live YB Races Interactive Map was introduced to help spectators follow the teams over the duration of the race. It really helped our race crew get ahead of The Rural Planners in time to cheer them on. Bryce got into the car in the early morning hours after finishing the race and could hardly keep himself up. The first stop was to get him drinks with electrolytes. He perked up and I asked if he would ever compete in a canoe race again. “Never again”, he said. I then asked what inspired him to compete in the Algonquin Outfitters Muskoka River X race in the first place? He muttered, “I just wanted to improve my paddling skills”, before passing out in the front seat. 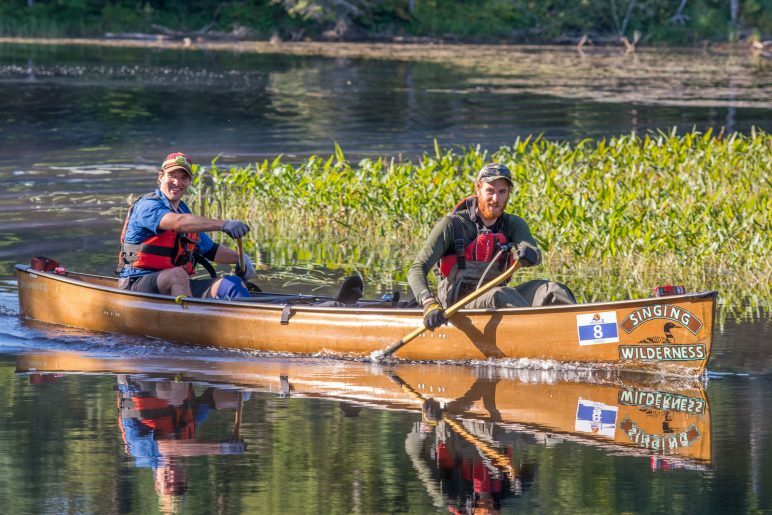 Seems a bit extreme to compete in the Coureur Des Bois just to improve paddling skills. I knew he was exhausted mentally and physically. After a 3-hour snooze for both of us, we travelled back to Huntsville to attend the awards luncheon at Hidden Valley Resort and pick up our canoe. Bruised and battered, The Rural Planners shared stories with other teams at the resort. It was hard to believe that after a year of planning and preparing, the race was over. What was even harder for them to believe was that they won third place in their category for the Coureur Des Bois race. I guess that’s why people put themselves through physical and mental pain during expedition races, to unexpectedly win a medal. Congratulations, boys! 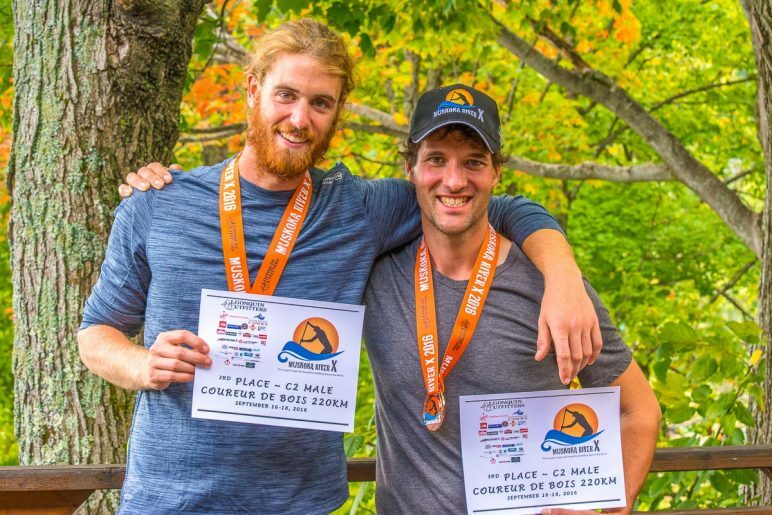 Waboose Adventures: How did you prepare for the Coureur Des Bois? Bryce: We discovered ultra-light bent-shaft paddles. Ours were custom made by Spencer Meany of XY Paddle Company in Atikokan, Ontario. We didn’t know it at the time, but switching from our tripping paddles to racing paddles made a world of difference. 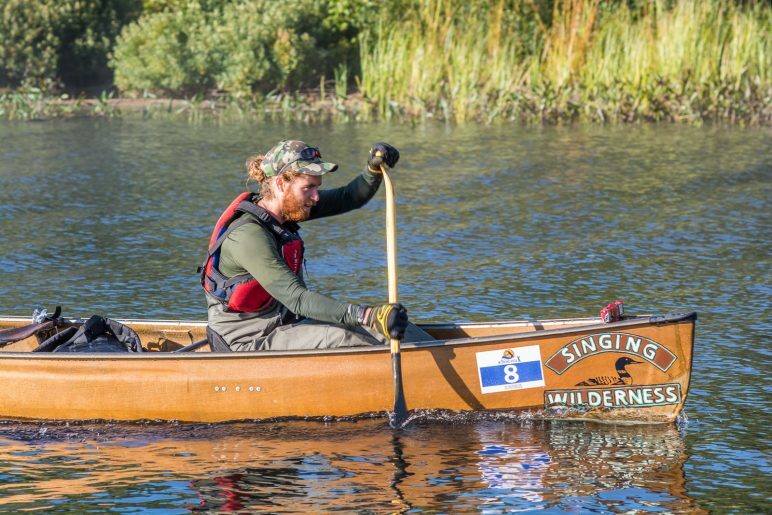 Once we had our paddles, we participated in paddling clinics by the Ontario Marathon Canoe and Kayak Racing Association with Chris Near in Huntsville. These clinics were super helpful in learning the ‘Hut’ or ‘Hit and Switch’ style of paddling. We also learned a lot of tips and tricks about how to set up our boat to eat and drink while paddling and how to paddle efficiently against current. Best of all we met a lot of great people! Nick: We also had to learn about how to fuel our bodies. We made many different kinds of homemade energy bars/bites and dehydrated fruit. We also used energy gels and ate boiled potatoes. Our diet definitely wasn’t perfect and our bodies started to reject food shortly before arriving in Port Sydney. A newcomer shouldn’t underestimate the importance of fuel! Bryce: We also spent a lot of time on the water familiarizing ourselves with the course. 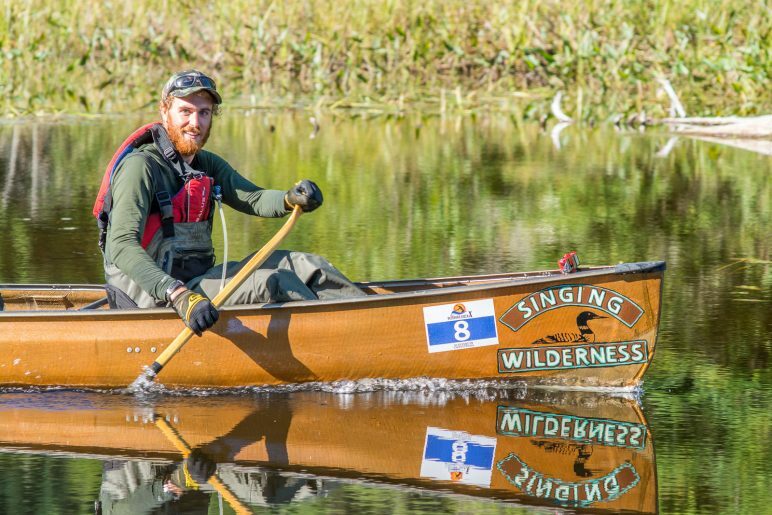 Hap Wilson’s “Canoeing and Hiking Wild Muskoka” was a huge help in this regard. We also invested in our skills by taking a full-day wilderness navigation course through Fleming College. We’re definitely better navigators because of the race. I also completed the Level 1 in Moving Water Canoeing through the Ontario Recreational Canoe and Kayak Association through Paddlefoot. Mark Orzel was an awesome instructor. We learned how to safely negotiate moving water and gnarly put-ins above rapids and falls. 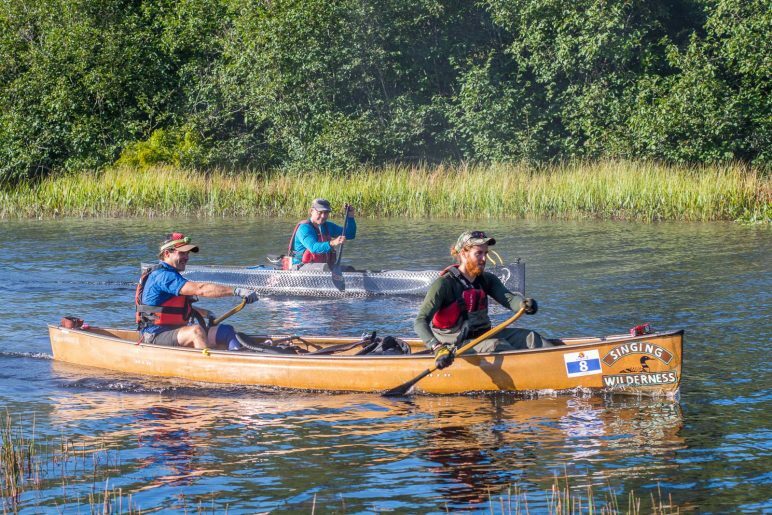 The Rural Planners are now looking at ways to improve their gear and strategy for canoe racing. They will race again!